Titanium Bulkhead Union, Ti. Alloy Reducing Union, Titanium Union Cross, ASTM B381 Titanium Tube To Union, Ti. Alloy Union Elbow, Titanium Alloy Union Tee, Ti. 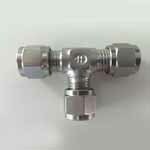 Alloy Tube Fittings Suppliers in Mumbai, India. Titanium Alloy nion, Titanium Reducing Union, ASTM B381 Titanium Tube Fittings Union, Supplier of Titanium Tube To Union, Titanium Union Tee, Titanium Alloy Ferrule Fitting Union Tee Supplier Exporter in India. Ganpat Industrial Corporation offers a high quality Titanium Tube to Union Fittings, which has some excellent features to offer such as fine finish, dimensionally stable, high material strength, and more. Available with us is a superior quality assortment of Titanium Tube Fittings. The offered spectrum of Titanium Compression Fittings is manufactured keeping in consideration the requirements of our respectable customers. High quality steel is utilized by our experts to manufacture the offered range of Titanium Ferrule Fittings following industry set guidelines. Titanium Double Ferrule Fittings also has some other exceptional features to offer such as durable, light weight, high tensile strength and more. Meanwhile, Titanium Union Fittings are also being offered in different sizes and shapes to our customers. Titanium Tube Fittings has outstanding corrosion resistance and useful strength (similar to austenitic stainless steels) at low density. Titanium Compression Fittings resist in contact with salt water and marine atmosphere, oxidizing acids, chlorides (in presence of water). Titanium Ferrule Fittings has good corrosion resistance in a wide variety of acids, alkali, and industrial atmospheres. Commercially Pure Titanium Double Ferrule Fittings has moderate strength and excellent cold forming properties. Titanium Union Tube Fittings is classified into excellent material depending on the yield strength and allowable levels of the elements iron, carbon, nitrogen, and oxygen. Each order is packaged according to the customer’s standards including preparation for export such as wooden case, pallet or according to customer’s requirement All shipping documentation is provided for Titanium Gr.2 Tube to Union delivery from mill to customer. We understand the importance of packaging specially in case of international shipments as the consignment has to go through a number of channels to reach the final destination, thus we take proper care of packing. We pack our goods in a various ways depending on the products. Pimpri-Chinchwad, Sharjah, Courbevoie, Noida, Atyrau, Dammam, Visakhapatnam, Hanoi, Port-of-Spain, Hong Kong, Bangkok, Secunderabad, Indore, Baroda, Singapore, Muscat, Jaipur, Geoje-si, Kolkata, Chennai, Kuala Lumpur, Busan, Mexico City, Los Angeles, Dubai, Jeddah, Madrid, Rio de Janeiro, Haryana, Thiruvananthapuram, Brisbane, Manama, Thane, Algiers, Chandigarh, Coimbatore, New York, Chiyoda, Navi Mumbai, Howrah, Aberdeen, Toronto, Ho Chi Minh City, London, Edmonton, Milan, Sydney, New Delhi, Dallas, Santiago, Gimhae-si, Doha, Abu Dhabi, Lahore, Cairo, Petaling Jaya, Ahmedabad, Al Khobar, La Victoria, Ludhiana, Lagos, Al Jubail, Tehran, Rajkot, Melbourne, Vadodara, Nagpur, Jamshedpur, Moscow, Gurgaon, Nashik, Granada, Bengaluru, Ahvaz, Karachi, Bogota, Kuwait City, Ranchi, Calgary, Ankara, Hyderabad, Houston, Ulsan, Riyadh, Kanpur, Bhopal, Ernakulam, Perth, Montreal, Jakarta, Seoul, Vung Tau, Pune, Istanbul, Surat, Caracas, Mumbai, Faridabad, Colombo. Norway, Ecuador, Australia, Gambia, Serbia, Ghana, Kazakhstan, Croatia, Tibet, Bhutan, Brazil, Iraq, South Africa, Puerto Rico, Yemen, Poland, Vietnam, Argentina, Chile, Saudi Arabia, Belarus, Libya, Zimbabwe, Gabon, Morocco, Nigeria, Sweden, Taiwan, Kenya, Indonesia, Peru, Angola, Kuwait, Hungary, Bolivia, Pakistan, Azerbaijan, Malaysia, Colombia, Iran, Nigeria, Ukraine, Chile, Ireland, Israel, Austria, Afghanistan, Lebanon, Slovakia, Sri Lanka, Canada, Bangladesh, Japan, Namibia, Portugal, Mongolia, Mexico, Iran, Poland, Estonia, Thailand, Qatar, Egypt, Spain, Jordan, Switzerland, Finland, Denmark, Russia, Italy, New Zealand, Macau, Bulgaria, Algeria, Germany, Mexico, Belgium, Trinidad & Tobago,Tunisia, Bahrain, Philippines, United Arab Emirates, India, Turkey, United Kingdom, United States, Singapore, Netherlands, Oman, Czech Republic, Greece, Lithuania, Costa Rica, Nepal, South Korea, Romania, China, Venezuela, France, Hong Kong.